I judge a concert by if I get goosebumps and by how sore my throat is at the end. Last night I had goosebumps on nearly every song and my throat was wonderfully raw. Bruce can’t run and slide on the stage any more, but he makes up with raw emotion and an earnest pursuit of good times and a healthy view that life is a bumpy road. For Bruce the bumps in the road don’t destroy you they define you. Bruce’s success is that he understands the redemptive power of rock and roll and knows how to dispense that sacrament. Less wildly than in his youth, it has been replaced with mature reverence. The gimmick of this tour is that Springsteen would perform his 1980 masterpiece The River in its entirety (plus another 80 minutes of hits as a cherry on top). The River may not be Bruce’s most popular album, but it perfectly defines becoming an adult with a full complement of real emotions: the release of Friday night, the joy of Saturday night, the contemplation and regret of Sunday, the dread of Monday, etc. I have had the double album from when it first came out and to be honest it never really resonated with me – I was still too into Darkness On The Edge Town and did not quite get The River (in hindsight I was still too young at 21 to get it). Over the years it has grown on me and when the box reissue came out recently I embraced it and it all made perfect sense. Hearing Bruce’s 66-year-old take on his 30-year-old self last night was amazing. The rockers were pure joy and the ballads were heartfelt. Bruce provided just enough intro dialogue to whet your appetite – but never too much to ruin the meal. I was worried about how the slow material from The River would go over in a concert setting, but the ballads ended up being a highlight. 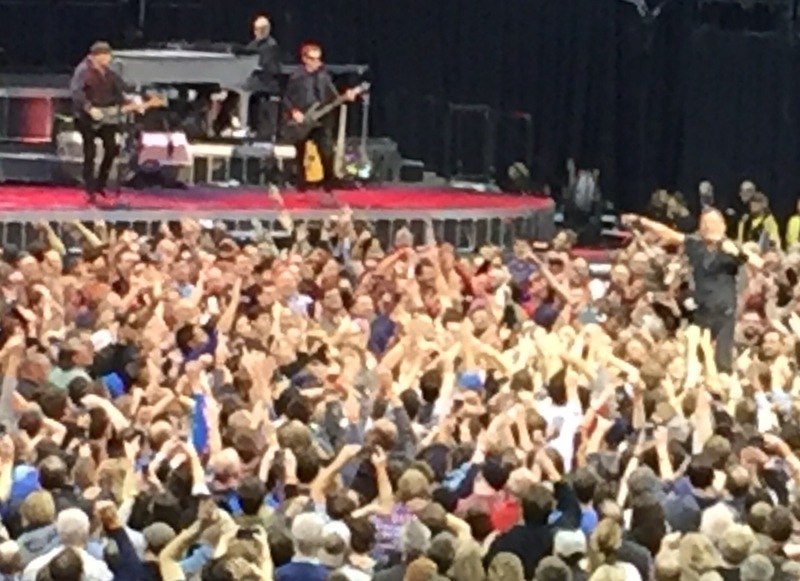 And then there were great concert memories: a millionaire rock star crowd surfing, Bruce dancing with an old lady from the audience, Bruce and Little Steven singing cheek to cheek, the audience singing as an intro and the pumping arms to the finale “Shout. A great concert is also about the state of your mind coming into the show and mine was perfect: left work early (and the next day off – a Friday night vibe), had a little nap, pre game dinner at home with my family, concert partners of my bride (who was very revved up for the show) and my daughter (crossing off yet another legend off her bucket list) and her boyfriend (birthday boy) – in short family – the joys of my life – the prefect context to plunge into The River. A thoughtful review which certainly gels with my own recent experience of seeing my first two Springsteen shows. I’ll take it from you that he’s still doing it. So many good songs on ‘The River’. Good review by the way.